I am grateful to say that this summer I had the opportunity to work with Dr. Irene C. Solomon at Stony Brook University, in the Department of Physiology and Biophysics, as an awarded fellow from the American Physiological Society’s Short-Term Research Education Program to Increase Diversity in Health-Related Research (STRIDE) Fellowship. Under the mentorship and guidance of Dr. Solomon, I was able to explore the scientific field of neuroinflammation and the underlying neural mechanisms controlling our central respiratory system. 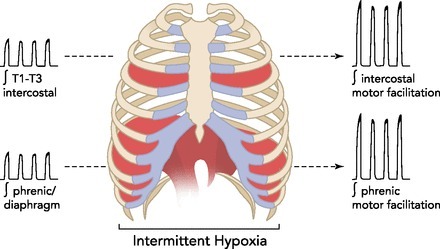 Acute Intermittent Hypoxia (AIH), also known as the delivery of low levels of oxygen in repetitive bouts, has been demonstrated to alter neural ventilatory control, and therefore, elicit different physiological changes within the respiratory system that can persist into normoxia (also otherwise known as normal O2/CO2/N2 levels). These alterations are more formally known as neural plasticity, which is the nervous system’s response to varying, natural stimuli and/or the initiation and progression of diseases, injuries, and pathology. What that means is that the nervous system attempts to compensate for the lower levels of oxygen by increasing the expression of neurotransmitters like serotonin and adenosine, which then affects the upregulation of specific growth/trophic factors within the Gq and Gs pathways involved in eliciting neural plasticity. More specifically, the G protein coupled receptors (GPCR), serotonin 5HT2 receptors and adenosine A2A receptors, are being targeted within the Gq and Gs, respectively. 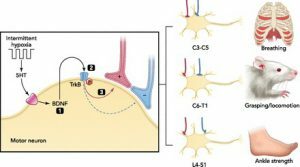 Although there seems to be some interplay between these two pathways, the Gq pathway and the activation of the serotonin 5HT2 receptors appear to play a larger role in stimulating the physiological changes found during and after AIH. 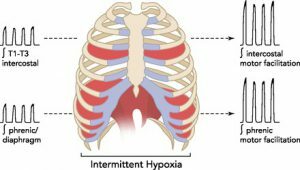 The physiological changes that follow (i.e.increased phrenic motor neuron and diaphragm activity), are utilized within the central respiratory system to essentially breathe “better,” or in other words, consume more oxygen, in such hypoxic conditions. released via bacterium rupture or disintegration — indicates that inflammatory processes can also alter ventilatory control, and subsequently, affect the level of respiratory plasticity that can be achieved. The interactions between LPS-induced inflammation, and accompanying neuroinflammation, and various aspects of ventilatory control, however, are not well understood. It is important to understand how LPS affects the respiratory system since LPS-induced neuroinflammation remains to be a compounding factor of many diseases, such as sepsis, acute lung injury (ALI), and/or acute respiratory distress syndrome (ARDS), and serves as a cause of mortality across a wide variety of respiratory malfunctions (e.g. previously mentioned, OSA). Therefore, the fundamental hypothesis guiding this study is that inflammatory processes can impair multiple aspects of central respiratory neural control, resulting in a reduced ability to adequately and appropriately compensate for disease/pathology. The overall goals of my study are to (1) characterize and quantify the effects (basal ventilatory and respiratory-related neural activities) of moderate (11%O2) AIH in spontaneously breathing male rodents to the 2-hit LPS-induced neuroinflammation model, in which the rats will endure 5 cycles of 3 minutes of 11% O2, 2% CO2, and 87% N2 on and off, and (2) to characterize and quantify the chemical control of breathing via immunohistochemical analyses of various elements from collected tissue samples (e.g. respiratory brainstem cytokines expression, along with neural markers from the Gq pathway). In the beginning of my fellowship, I spent a great deal of my time acquiring new methodological techniques and learning surgical procedures often used in conducting the physiological experiments that are run in lab. 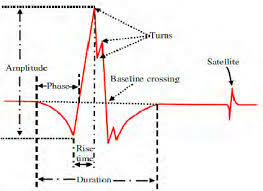 Some of the essential skills included establishing EMG signals using tongue and diaphragm electrodes, which is short for electromyography and is an electrodiagnostic medicine technique for evaluating and recording the electrical activity produced by skeletal muscles and the nerve cells that control them (motor neurons), giving intraperitoneal injections (IP), intratracheal injections (IT)., and subcutaneous (sc) injections, conducting femoral and jugular cannulations, administering i.v. drug/saline supplements, and collecting tissue samples that were stored in liquid nitrogen. After acquiring the necessary skills, I was able to spend some time developing a thorough protocol that would help outline the experiments I would be running, and determine what my main hypothesis would be based off of previous findings from the lab and publications I read. I was also given the opportunity to develop my presentation skills as I would prepare and give a presentation on a paper during our bi-weekly lab meetings with the Collins Lab, who we extensively work with, and engage in meaningful conversations on new insights my fellow peers would bring up. I am currently going the data analysis of the rats’ BPM frequency and cyclic height (amplitude) for signs of either an increase or decrease in respiratory motor plasticity post-hypoxia. Immunohistochemical staining of the tissue samples collected will be used to further analyze respiratory brainstem cytokines expression for signs of neuroinflammation and potential decreases in neuroplasticity. Throughout my experience at the Solomon Lab, I have come to realize that the strange and mysterious world of scientific research is not one of only cut-throat competition and solitude, but a juxtaposition of individualized responsibilities and teamwork. There is something about research that, oddly enough, reminds me of my favorite childhood cartoon show, Scooby Doo. Just like how the Mystery Gang goes around in their fruity van looking for clues to solve the case and figure out the culprit of the crime, a research lab — surprisingly — works in a similar manner. See, being a part of the journey in trying to solve the big mystery is a team effort, unlike the stereotypical image most people conjure up in their minds of an old, crazy gray-haired scientist mixing chemicals together in an underground lab. Just as every member in the Mystery Gang was important to cracking the case, all members in a lab must be willing to cooperate and take on the smaller assignments in order to contribute to the larger picture and find the missing clues to the puzzle. And that’s what I love so much about scientific research: the camaraderie that forms among peers in a lab — sometimes even extending beyond the doors of your very own lab and with the people of the lab across yours. Overall, I am not only grateful for receiving the opportunity to delve deep into the world of physiology and neurobiology research, but also for the opportunity to meet such fantastic people who have helped me grow as a scientist and as an individual. Rashi Bhatt is a sophomore majoring in Computational Neuroscience and Public Health, with a minor in Computational Medicine at Johns Hopkins University in Baltimore, MD. She is a Short-Term Research Education Program to Increase Diversity in Health-Related Research (STRIDE) Fellowship working in Dr. Irene C. Solomon’s lab at Stony Brook University in Stony Brook, NY. Rashi’s fellowship was funded by the APS and a grant from the National Heart, Lung and Blood Institute (Grant #1 R25 HL115473-01). 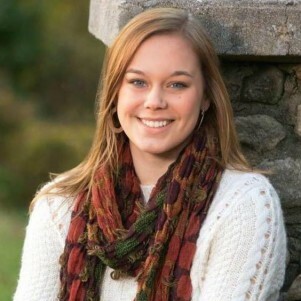 After graduation, she plans on attending Johns Hopkins Bloomberg School of Public Health to receive her MPH and hopefully go on to attend medical school, and specialize in neurosurgery and neuro-imaging. From reading your blog post, it sounds like you had a wonderful summer experience through the STRIDE program. I’m very excited to meet you at the Experimental Biology conference in April to learn more about how your study turned out, as it is extremely interesting to me because the significance of this project has a large magnitude that can pertain to a wide variety of individuals. I loved how you compared your experience within the lab to Mystery Gang; it was a great analogy that described a very true aspect of the laboratory environment – something I also learned this summer, too. I also used a mouse model, so it’s interesting to compare the similarities and differences of that specific methodology for our projects. I hope your academic year is going well!